In space, no one can hear your meme. The Japanese HTV-3 resupply craft is currently on its way towards the International Space Station. Alongside its cargo of food and parts, the craft is carrying an extra passenger: a tiny laser-engraving of one of Portal 2's cores, pictured on the right. 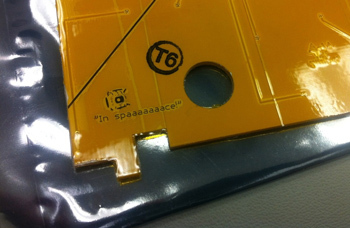 The etching is the work of an anonymous NASA tech, one with good taste in games, apparently. Now there's some to confusion as to when the HTV-3 launched. Many sites are reporting that the cargo rocket is set to launch on July 27th, while others claim it began its merry journey to the ISS last Friday. There's also some confusion as to which core is making the journey into space. The Portal 2 blog labeled it Wheatley, but as many of you are no doubt itching to point out in the comments section, the "in spaaaaaace" quote actually comes from the Space Core. Observant gamers, however, will note that the core depicted on the panel actually has Wheatley's distinctive circular "pupil" rather than the Space Core's hoop-shaped one. That may, in fact, be the nerdiest sentence I have ever typed. Either way, one core is making the trip into space, though Valve is quick to point out that it's strictly an unofficial member of the mission. "NASA in no way officially endorses secretly laser-engraving characters from Portal onto their spacecraft," reads the blog. "Believe it or not, they don't even officially endorse Portal 2, despite the fact that it's a really excellent game."